Interspecies friendships abound in literature for children – from Wilbur and Fern to Babe and Farmer Hoggett. 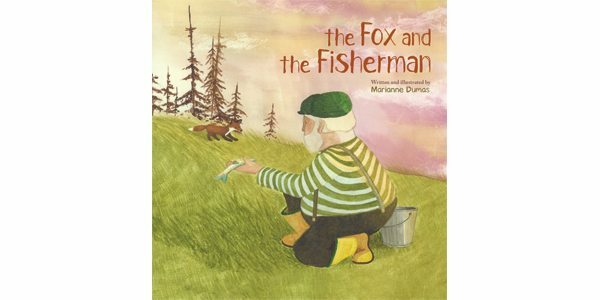 Quebec-based author and illustrator Marianne Dumas upholds this tradition in her debut picture book, The Fox and the Fisherman. The story begins with the fisherman Barnaby setting about his daily work. A portly gentleman who resembles Ernest Hemingway (if the writer were to don a striped jumper and yellow Wellingtons), Barnaby’s life is one of steadfast routine. “As always,” is the refrain of the first half-dozen pages, emphasizing the unchanging nature of this solitary fisherman’s day-to-day existence and giving the narrative a folkloric flavour. Enter the fox. At first, she and the fisherman watch each other from afar. Barnaby earns her trust slowly, proving his kindness with offerings of fish left by the shore. Unlike so many books for children, there is no anthropomorphism here. The pair sit together, silently watching the sea and delighting in each other’s quiet company. At long last, Barnaby has a companion. When the fox fails to appear one evening, Barnaby fears he has lost his friend for good. But the fox eventually returns – with a happy surprise. That day, Barnaby hauls in more fish than ever – harvesting a rather overt metaphor for the bounty of friendship. Dumas is a gifted painter, and many of her watercolour illustrations are striking. She has a knack for capturing raw emotion, and is at her best when depicting the fisherman and the wildness of the sea. One visual pitfall may be the layout of the text, which can be distracting at times with its many arcs and angles. The Fox and the Fisherman explores themes of loneliness and yearning for friendship that will be familiar to most readers – be they children or adults.